If your cat is favoring its paw, should you call the vet? Cat's four paws are essential to their well-being. Their paws are used for pouncing, jumping and playing. It's not uncommon for a cat to injure one of its paws. As with any injury, there are so many variables involved, like age, weight, species/breed of animal, and the type of impact or injury that caused the lameness. Injuries to a cat's paw can be painful. As a responsible pet owner, it can be helpful to for pet owners to identify when an injury is an emergency or if it can wait a bit for observation at home. When examining the hurt paw, it is helpful to notice if the paw is swollen. Soft tissue swelling could mean a few things: insect bite or sting, infection, an abscess, or blunt tissue damage. Bee stings can produce a huge swelling very quickly but aren't usually too painful. (Cats are generally more prone to getting insect bites/stings on their paws from batting at bugs, whereas dogs typically get swollen lips from trying to snap at the bugs.) This is an allergic type of reaction, and if it doesn't get infected, will go down in 24 hours or less. Your veterinarian can administer or recommend medications to help reduce swelling and stop the allergic reaction. Minor paw scrapes can best be treated with some gentle at home care. Clean and wash the affected area two to three times a day with warm soapy water. Try to avoid leaving the wound open, especially near the kitty litter box, as this can lead to an infection. A bandage or homemade protective bootie (made from a child's sock and medical tape) will work to protect the injured paw while it heals. Other bites and stings, such as those from spiders, scorpions or other insects can produce painful, nasty swellings with tissue necrosis (death). It is wise to call your veterinarian as soon as you notice any swelling on the paws or elsewhere. Punctures, bites, and other tissue trauma can also produce large swellings that are infected (pus-filled). These swellings are often are painful, depending on what stage of infection. Call your veterinarian as soon as possible, medications to treat each condition are different, and if untreated, can get considerably worse in a short time. Additionally, if a minor injury, such as a paw scrape, is not improving after about a week, it can be wise to call a vet, to make sure there is not another larger issue going on. Most cats with a foot or footpad injury will make a full recovery in one to two weeks. 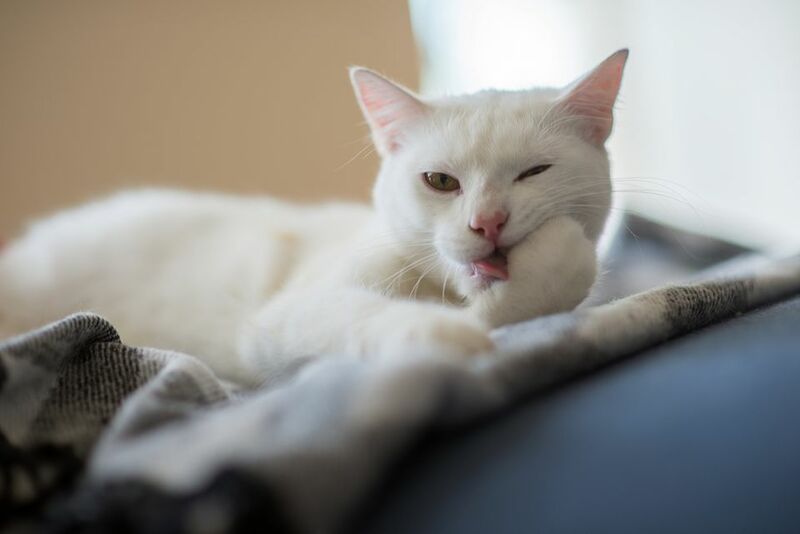 To prevent further paw injuries, cats should be regularly groomed and avoid rough surfaces. Cats with very long fur should have the fur between the paw pads trimmed regularly to avoid small irritants getting lodged in the paws. Additionally, there are lotions available at most pet stores for dried and cracked cat paws. Most veterinarians will be able to help with recommendations for treating injuries and avoiding them in the future.